Shopping in Seoul, South Korea is not exactly cheap (except for skincare products from local Korean brands) but there is a way that you can get more bang for your bucks – claiming VAT tax refunds from your shopping in Korea. You can enjoy 10% tax refund when you spend more than 30,000 Korean won (KRW) (about 30 USD or 38 Singapore dollars) from any shop in South Korea with Tax Free logos – the more notable ones are Global Blue Tax Free and the Orange Global Tax Free logos. This applies anywhere in South Korea e.g. Seoul, Jeju and other parts of the country as long as the shop has the logos shown in the picture below. 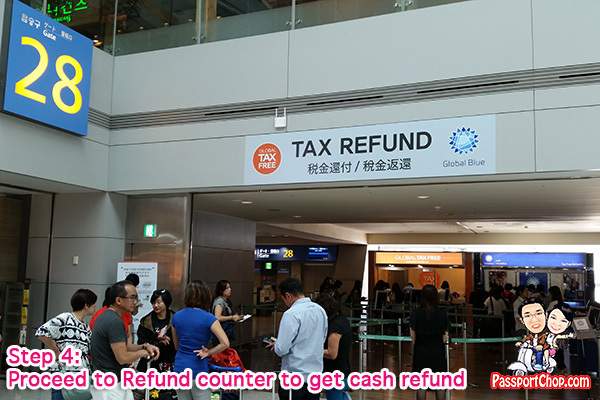 I will be sharing with you a guide to claiming tax refund not just via the traditional way of claiming tax refunds at airport but how you can also save a lot of time claiming tax refunds in Downtown Seoul while your shop. Even when you buy Korean snacks e.g. Lotte cookies, Korean ramen from supermarkets like Big C, you can also claim for tax refund if you spend more than KRW 30,000 (Korean won). Simply proceed to the Information Counter for help on claiming tax refund. You will not get paid your 10% VAT tax refund on the spot. You will have to ask the cashier for a tax refund slip – typically provided in a white and blue envelope (Global Blue Tax Free) or in a white and orange envelope (Global Tax Free). The tax refund slips and receipts are typically written in Korean but you can easily deduce how much tax refund you are eligible for. So Step 1 to claiming your 10% tax free is to get your tax refund slip. Before you get too excited about tax refund claims – do note these conditions for tax refunds. You must have spent at least 30,000 Korean won (inclusive of tax) at a shop participating as Global Blue or Orange Global Tax Free. Whatever you bought must have been purchased within 3 months of your departure from Korea. You must be an foreign visitor who has been residing/visiting in Korea for less than six months or is an overseas Korean (holder of Korean passport and permanent resident) residing in/visiting Korea for less than 3 months or is a Korean student studying abroad for three years or more. These persons are not eligible for tax refund claims: U.S. Armed Forces in Korea, diplomats in Korea, foreigners without passport, those who overstayed their visa, foreigners working in Korea. The typical way to claim your tax refund is via the customs office at the airport. Your purchased goods will be subject to examination so don’t pack your purchased items in your check-in luggage yet. 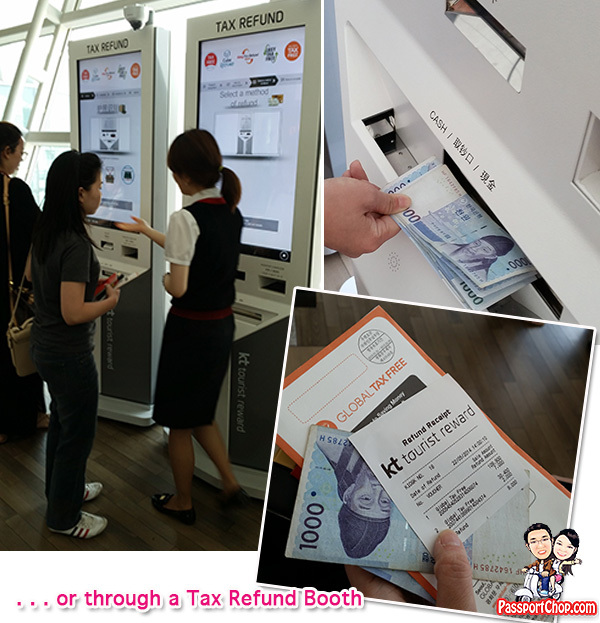 Look for the Tax Refund/Customs Declaration counter in the Incheon airport (if you are flying back to Singapore from Seoul). Typically there are quite long queues – ensure that you have filled up all particulars on the tax refund slip and that your purchased goods are easily accessible for inspection (if needed). The aim is to get the coveted “All Goods Exported” stamp on your tax refund slip. We were lucky that we need not display our purchased goods – it will be very troublesome to show all the facial masks and skincare products for verification. I think the customs officers do random checks. You can check-in to your airline first – just inform the check-in staff that you have tax refund items in one of your bags to be checked in. They will do what they usually do with checked-in luggages e.g. stick on the baggage claim labels and return the bag to you. You will need to bring this bag to the custom office to get your “All Goods Exported” stamp. Once you have gotten the custom stamp, deposit your bag at the oversized baggage counter next to the custom counter. So to recap: Step 2 – get your “All Goods Exported” stamp at the customs office/counter at the airport. There are airport staff around the customs office to assist you with your tax refund after you have gotten the stamp of approval from the customs officers. We had to scan our receipts using Tax Refund machines – not quite sure what this step is all about – just follow instructions from the staff. You will still not get your money here. Proceed to check-in your luggages and go to the secured airport area after clearing immigration. At Incheon airport, the gate to take note of within the secured airport area is Gate 28. This is where the Global Blue Tax Free and Global Tax Free offices are located at. 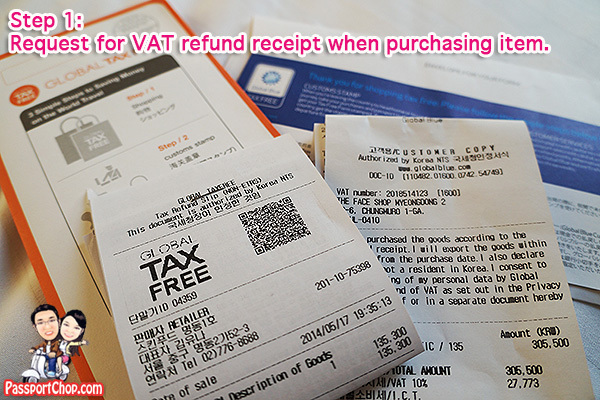 You will typically have tax refund slips from both companies if you do a lot of shopping in Seoul. Do note that Global Blue Tax Free office will not process your tax refund slips from Global Tax Free (the orange one) so if you have a mix of both tax refund slips – you will need to re-queue at the other office after you have completed with one. Do note that if you don’t have the “All Goods Exported” stamp on your tax refund slip, you can forget about claiming your tax refunds. Claiming your tax refunds via the Global Blue Tax Free and the Orange Global Tax Free at Gate 28 is not the only way – some receipts are eligible for auto-tax refunds via Tax Refund machines in the airport – try to scan your receipts to see if your receipts are eligible. I think this is what the above Step 3 is about – to check the eligibility for such auto-tax refunds before you clear immigration. Do note that the tax refund process at the Incheon airport can involve quite a lot of queuing so get to the airport early if you intend to do tax refund claims. For international flights by non-Korean carriers e.g. Singapore Airlines, you will still need to take the shuttle train to the other terminal to catch your flight so do budget some time to do these tax refunds if you plan to do so at Incheon Airport. If you are leaving the country from an airport/port that does not have a tax refund counter or got your documents stamped but did not have the time to visit the tax refund counter or are traveling at a time when the counter(s) is closed, drop off your tax refund slips at the Refunds Box. The tax refunds will be sent directly to your credit card-linked bank account. There is another way to settle your tax refunds even before going to the airport and skip all the queuing and waiting at the airport. There are various locations in Seoul where you can get your tax refunds processed for Global Blue and Orange Global Tax Free tax refund slips (see table below). (3) Your credit card. Your name in the passport must match that of the credit card. You are not required to bring your purchased goods. Your credit card will be charged with the same amount as the tax refund eligible to you as a guarantee. The payment will be cancelled once the stamped tax refund documents arrive at the respective tax refund agency within a certain period of time. You will be refunded in cash. The staff will stamp “CASH PAID” at all receipts and return the receipts to you. 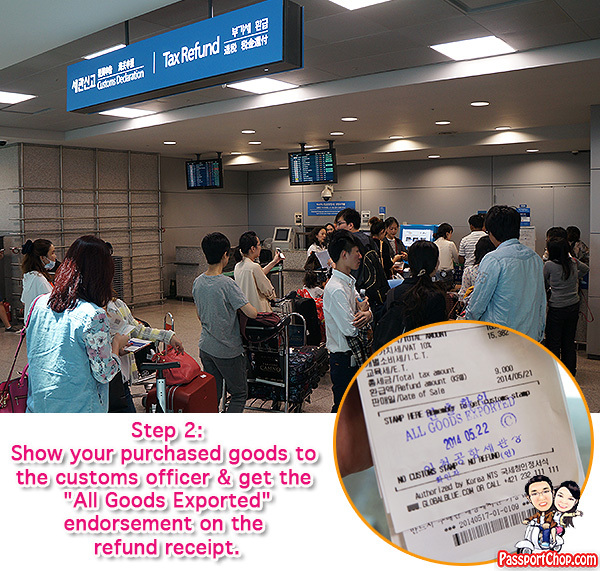 You will still need to present your receipts and tax refund slips and your purchased goods for customs inspection at the Incheon airport (see Step 2 above). The customs officers will stamp “ALL GOODS EXPORTED” on these receipts and will not return the tax refund slips to you. The customs office will send these stamped receipts/tax refund slips back to Global Blue or Orange Global Tax Free. You must complete this step and ensure that you don’t end up with the stamped tax refund slips (these slips should go direct to the tax refund office). If you miss this step, you will forfeit the guarantee charged to your credit card plus penalty fees (about 15%). Do note that Global Blue accepts MasterCard credit card but Orange Global Tax Free does not accept MasterCard (VISA credit card is ok). 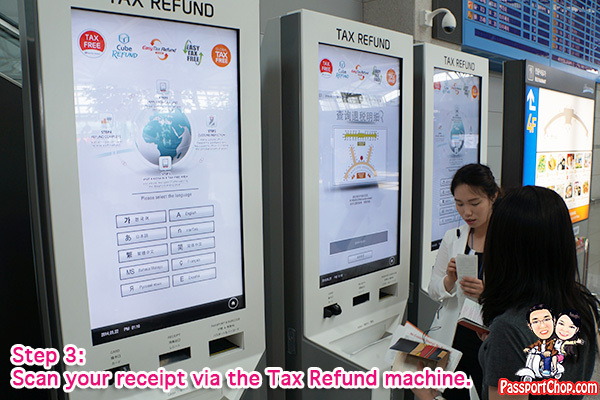 By claiming tax refund downtown in Seoul, you save time on queuing at the airport. You also get extra cash to spend with the tax refund! Do note that while you can process most of your tax refund slips downtown, there are still some tax refund slips that require you to claim directly at the airport e.g. handwritten tax refund slips. Shopping online is one way you can avoid all these hassle of claiming tax refunds – for example with online fashion and beauty retailer Zalora – you can find watches online for women – right now there are over 99+ designs to choose from! Wow, thank you for such great advice and wonderful explanation. This is bar far the easiest and best explanation that is logical and good to read! I’m so glad you told me about this process. So many people should know about this. I want to confirm, for the purchases, do i have to make purchases using Credit card in order to claim tax refund? Can I pay in cash and get the receipt and still get refund? Does cash payment work for Seoul city claims? You do not have to make purchases with credit card to claim tax refund. You can pay in cash and request for the tax refund slips and receipts (if you spend more than 30,000 KRW at a shop where tax refund is available). Not sure what you meant by your last question but yes you can pay in cash and enjoy tax refunds if you are eligible. I have already left Korea but forgot to claim for my tax refund at the airport. Can I still claim for my tax refund from overseas? If it is still possible to claim for my tax refund from overseas, how do I do so? Did you get a customs stamp on your refund forms? If no, then there is no way you can get tax refunds. If yes, you will have to check with Global Blue Tax Free – http://www.globalblue.com/ or Global Tax Free for tax refunds via mailing the refund forms (with customs stamp) to them. Thanks Zhiqiang & Tingyi for your response. No, unfortunately I did not get the stamp on my tax refund forms. So I guess it’s a lost cause for me. Thanks anyway. were can i change my cheque here in Phillipines??? hi, you mentioned that Global Blue accepts Mastercard credit card and that Orange Global Tax Free accepts Visa credit card. Does the global blue one accept visa too? How can I get my refund back? May i know if you have any idea of what time the Custom Office, Global Blue Tax Free and Global Tax Free offices closes at the airport? It states 7am to 9pm for Global Blue. You can search online for opening hours of other tax refund offices. Hi, if i do tax refund in Myeong dong, does this means that I can skip step 1 in the airport and start from step 2? Just to minimise confusion, step 1 according to this article is collect the blue/orange tax refund forms from the vendor – that still needs to be done. Step 2 (according to the article) is still required. You need not do Step 3 and 4 (according to the above article). Bottomline, you need to get your goods inspected by customs at the airport and submit your tax refund forms to them. Hi, I did a city refund but missed out on getting one of the receipts stamped at customs. Is it possible to get a friend who happens to be going to Korea to get the stamp on my behalf? The difference between my arrival date in Korea to my friend’s departure date from Korea is less than 2months. you will need to call/email Global Blue or Global Tax Free to check on this. I think there is a time limit before they check whether the receipts had been customs-stamped – after which, they will charge your credit card. Hello, do you know if the tax free form must be issued on the same day as the receipt? for our purchases, it is issued on the spot with the receipt. if you missed that, then you will have to check with the shop if they can reissue. Is it necessary to bring our credit card and submit the tax refunds receipt ? i assume you are referring to claiming tax refund at the airport and you have cleared the goods with customs. if thats the case, all you have to do is bring tax refund receipts to the tax refund counter and they will give you cash. no need for credit card. Hi , can I ask can I go to the tax refund counter first at incheon airport to do the custom chop first than proceed to airline check in ? Just wondering, is there a tax back refund for surgical procedures donei in korea? Hi.i just back from korea .I’ve already claimed the tax using the machine but on the last day I didn’t make it to the custom office because lack of time .do you know what will happen to my credit card? Hi . I just back from korea . I’ve already claimed the tax using the machine but on the last day I didn’t make it to the custom office because lack of time. What will happen to my credit card .is it going to charge for the whole price of my purchase or only the price of the tax ? Hi. Should the KRW30,000 worth of purchase be in ONE shop and in SINGLE transaction to be able to get tax refund? OR can the receipts be accumulated until you reach the minimum purchase? Say you purchased worth 10k today, and the next day 20k, can i ask for tax refund receipt at that store for those two separate transactions? A good write up. As j am the lazy type. If I was to get the form from the tax free shop and get it endorse in Myedong, I just need to gather the custom stamp in Incheon before put the receipt into the refund box right? (As I do not want to wait), somehow custom will deposit the refund to my credit card account right? Hi, this is a useful guide you wrote here. A question though: in South Korea stores, is the VAT usually included in the displayed price or is it added when you check out? If I pay for my goods in cash, and then get my cash refund in Myeongdong, but forget to present my goods and slips at the airport, how will that affect me if I had bought everything in cash? Do they use my passport to charge me? Looking forward to your reply, thank you!! 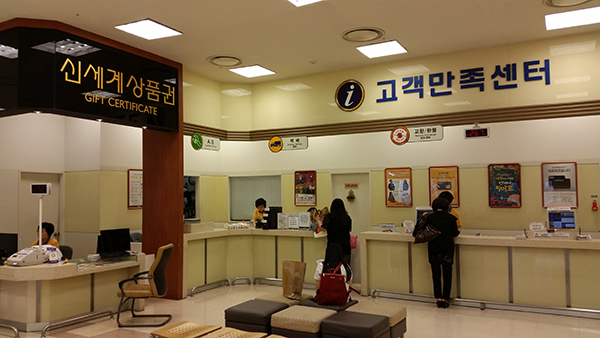 you will need to provide them with your credit card details when you claim your tax refund in Myeongdong. If you dont present your goods at the airport for inspection to get the customs stamp on your tax refund form, they will charge your credit card for whatever they have given you in cash tax refund in Myeongdong. Hi there, thank you for your useful guide and answering all the questions in comments. I have another one, about credit card. In my country it’s not a common thing to use credit card. But most of us use debt cards – VISA, Mastercard etc. Can we get a tax refund presenting our debt card data? I have a question! So I understood that the minimun purchase per shop is 30000krw and a receipt should be over that for me to claim tax refund. Is there a limit of how many over 30000krw receipts i claim? Say I have 5 reciepts with the amount over 3000krw. Can i claim them all from the refund desk? What is the limit? no limit to how much you can claim. Can we get a tax refund presenting our debt card? if it works the same way as a credit card, then should be fine. You might want to check with your bank if money could be credited into the card. Hello there! Thank you very much for the informative write up. Was wondering if I were to purchase makeup across different brands in a department store (e.g shinsegae, lotte), will it be a single transaction such that the receipt is above 30000KRW? Thank you for all this information! If the minimum is KRW 30,000 on one receipt to get immediate refund – I read somewhere the maximum is KRW 200,000. Is that correct? If it’s over KRW 200,000 we can get the refund at the airport or refund booth? So if you spend less than 30000 won at the stores, do you still need to deal with customs at the airport? Do you have to pay any sort of tax for spending less? Or have you already been charged with tax for not spending over 30000 won? Everything you spend in South Korea in shops already have tax included regardless of how much you spend. If you spend more than 30k won, you can claim the tax you paid from the tax refund authorities. Thanks for compiling this list! I’ve been thinking about how to navigate my taxes and this was super helpful. I just had a Medical procedure done last week. They gave me the Global Tax refund form witch I brought with me to the airport. I scanned my passport and receipt at the machine but did’nt understand it. I went to the customer service Tax refund counter for help. Looking at my receipts they said, its all good, wait 2 weeks for refund! Did’nt know about stamps. I’m now back in the States and wondering! What’s your input and can I mail the receipt back? I have friends in Seoul! do they mean you have to wait 2 weeks to get your money? Are they refunding to your credit card? You might want to contact Global Tax refund directly to find out more. Now you tell me. It was only after I returned from So. Korea that I found out that I could et a tax refund but I needed to do it in So. Korea. At least when visiting Canada, you can claim your refund after you return. Thanks for info above. I want to ask is it allow to open/use the stuffs before I claim tax refund? Or am I not allowed to open /use until I back to my own country? It will be very helpful to me if you can reply me. Hi! Your post is really helpful in planning my trip to Seoul! However I was wondering if they accept debit cards instead of credit cards to be presented ? Can i check if i use the City Airport Checkin in CALT near Samseong Station., can i do the tax refund there? I understand ill check in my bags and collect only at my home country airport? All my puchase should be checked in with the luggage at the city airport. I am not sure abt that. sorry! Any idea how long the whole procedure including queing its going to take at Incheon Airport? And do need to use the blue of white form? Thx! depends on whether there are a lot of people. buffer 2 hours for tax refunds. what blue and white form r u referring to? Thanks for your quick response. On the Global Tax Free site they mentioned that there are 2 forms (Blue and White). But the site did not explained the differences and which one you have to for what purpose. But I will ask the customer services at the airport. Hi, i just came back from Seoul in early may and i bought some LINE stuff. After making my purchases, i asked the staff abt the tax refund and she asked me to use 1 of the tax refund machine where i scanned my passport and insert my credit card. I was then given this slip of Tax Refund Receipt (at the top it says Global Tax Refund Form?). I thought the tax refund will be refunded back to my credit card. But it has been about 2 – 3 weeks and there wasn’t any refund done at all. At the airport, i did go to the tax refund counter for other items but i can’t remember if i showed the other receipt which i claimed through the machine. And neither did i get any stamp or whatsoever. I’m quite confused. Are you able to give me some advice if i can still get back the tax refund? Thanks! You might want to email GLobal tax refund to find out. Sorry …, kindly put in few easy critical steps for me to do vat refund at Myeongdong, to play safe I will just use Visa card. Thanks so much for the detailed simple procedure. I’ve got one quick question. Can I use the item while in Korea if I were to get a tax refund? I want to buy a camera and use it during my trip. Also, can I buy from the duty free shop or do I need to buy at a shop with tax refund and claim it. Last time I went to a duty free shop and I had to pick up the camera at the airport on my departure day. hello im intrested in talking with you about the tax refund machine and process can you please replay my email ? Thank you so much for the valuable information.I have few queries regarding the Tax refund Policy.I would like to know whether we can get Vat Tax refund for Hotel stay and accommodation.I stay in a 5 star hotel I pay alot of tax during my stay for food and my hotel Room.Is it possible to claim that too ?? Hi, hope you can help me. Among the purchases I made in Korea which I paid using credit cards & cash, a couple of times I was given cash back immediately after they scanned my passport into some machine (looks like those at airport) . Once, I was given only the receipts when I told the cashier tax refund/credit; I was asked for passport. I paid in cash. At the airport, the ‘tax staff’ scanned all my receipts and told me ‘ok’, I proceeded to acquire a stamp on the 1 receipt out of the many. Hwr, the other (above) transaction which I paid cash for was not stamped whatever so bcos the tax staff just said ‘ok’. And I didn’t proceed to counter 28 for the cash back. Is there a recourse for me? to recover my tax credit portion? Hi can i just ask if everything that i bought in korea can i bring it back to the philippines like big shampoos and korean products and other food? Everything is very clear & detail, thank you. But may I know for the Price Tag on Shelves has included the 10% tax? Or will are the on shelves prices has not included the tax, and they add the tax at the cashier? I’m browsing some of the cosmetic and bag on their website but they’re also not written wether has the 10%tax is added or not. On the shelves, they will usually put 2 price tags – one before annd one after. Hi! I wanna ask if there is a need to have a credit card when getting the tax refund directly at the airport? Thank you! HI there.. thank you for your informative blog.. I would like to ask if i make purchase online (from big brand like FILA / Adidas) will i still get tax refund? Can I still get tax refund at the airport with the regular receipt when smaller shops don’t offer tax refund forms? I forgot to ask for a tax refund paper for single purchases over 30,000 won. Can I still get a tax refund ?